The Samaritan Centers in Nakuru, Kenya are home to over 120 boys and girls. These children come from different parts of the country and various desperately poor backgrounds. What they all have in common is the fact that the Samaritan Center is the only place they have ever known where they can be children – they don’t have to raise their younger siblings, they don’t have to walk for hours through the scorching sun to fetch water for the family, they don’t have to find their own food, work all day or wonder if they will ever go to school. Many of the children at our homes have lost their parents to disease or in the post-election violence a few years ago. Some children have run away from home because there was nothing for them, except deprivation. One of those children is Danson, who told me his story and showed me around the Center during my project trip. He left home at the age of 14 because he wanted to go to school. Without food or money, he walked for days until his was found by a kind stranger who took him to the Samaritan Center for Boys. There he experienced the love and care of a large family, his health improved due to the regular meals and medical attention and he was able to continue his education. After five years, at nineteen, he is only starting high school, but his spirit is strong - he’s more determined than ever to work hard to lift himself out of poverty and to help his younger siblings to a better life. Everything at the Samaritan Centers is simple – the children sleep in bunk beds in dorms, they have few personal possessions, there is no indoor plumbing, meals are prepared on a wood stove, the day is filled with school, homework and chores. And yet, there is an overwhelming sense of belonging, purpose, joy and love when you visit. The kids are open, friendly and curious. They love to share and play with visitors, they are proud to show their home and talk about their dreams for the future. There is no doubt – if you had to grow up in crushing poverty and lose your family, you couldn’t be in a better place than the Samaritan Centers! Danson by the "toothbrush tree" at the Samaritan Center for Boys. The children chew on small twigs of this tree until its fibers make a small brush, which they use for cleaning their teeth. 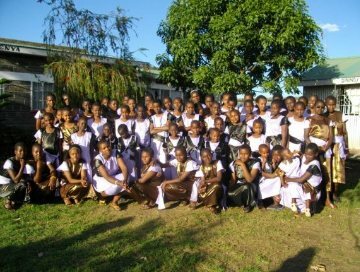 The girls at the Samaritan Center for Girls dressed in festive clothes.